MotorDog69's Set Screw Black License Plate Mount Setup. Coin Mount Fits 1 3/4" Challenge Coins. • Choose from our great challenge coin selection or use your own 1 3/4" coin. Challenge coin shown for display purpose. • Black License Plate Setup mounts to either top or bottom of your License plate, the license plate bracket has 4 different screw heights adjustments for flexability and different coin mounting positions . Once it's mounted it looks like it's part of your bike. • Personalize your own license plate and find out why thousands of our customers are riding with pride, when they mount something meaningful on their bike. • Now you can "Mount a coin, ride with pride, flip coin over, or re-mount a new coin, to get a new personalized look for the back of your bike." • USA Patented and Engineered, black powder coated, other finishes available. 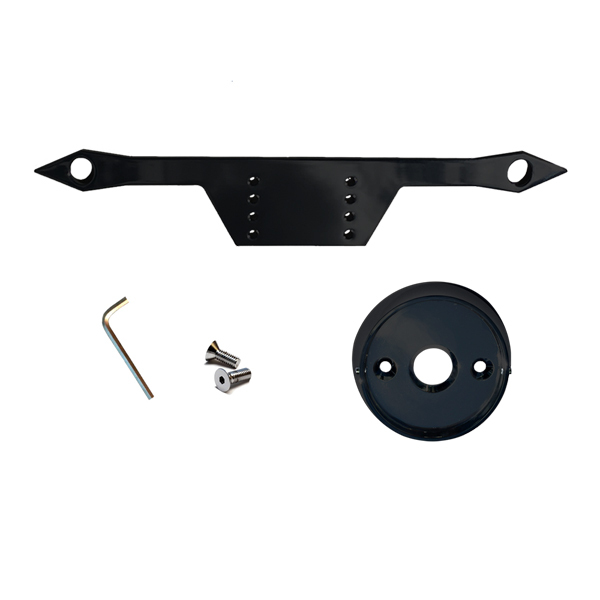 • Setup Includes: Set screw black license plate bracket, black challenge coin mount, challenge coin shown for display only, set screws, mounting screws, allen wrench, and easy to follow Instructions. Personalize Your Ride Today! • "Add A Piece Of Your Life To Your Bike"
• MotorDog69 Is The Inventor and Designer Of The World's 1st Adaptable Challenge Coin Mounts For All Motorcycles And Vehicles.